Army Rings Personalized for all divisions and units of the United States Army. 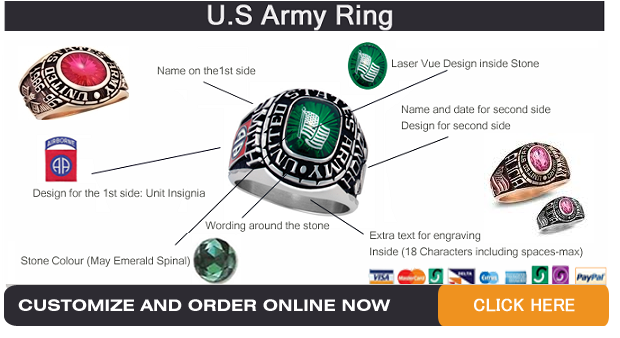 We specialize in retailing handcrafted customized Army Rings for the US Army personnel. The Army consists of hundreds of thousands of men and women. These are constantly on duty to protect the free world. Ready to respond immediately to any mission to defend our freedom. They provide a shield for our country’s national borders and interests throughout the world. In peacetime and during war, from private to general they are the world’s strongest fighting force. We honor the men and women currently serving in the Army. We also honor all those who are in retirement. There is no better way to honor those men and women for their commitment to us and to their country, than one of our stunning Army rings. Army rings are a beautiful enduring symbol of an officer’s or enlisted person’s commitment. A symbol that’s as enduring and strong as the commitment itself. The Army has seven core values: loyalty, duty, respect, selfless service, honor, integrity and personal courage. The strength of character these values represent is perfectly reflected by Army rings. US Army rings can indicate a person’s service in the Army in general or they can be customized to reflect membership in a specific regiment, battalion or other Army unit. Other Army rings incorporate the design of a specific combat medal, badge or other military decoration. Army rings are unique, beautiful and deeply symbolic. Rings generally use one of three basic designs. All designs are available in your choice of sterling silver, yellow gold or white gold. The first type is somewhat ornate and similar to the class or college rings. This style of Army ring conveys strength and usually has a colored stone or semi-precious gem set into its center. Symbolic designs are typically engraved or etched on each side of the stone. These can be stretching well down the sides of the band. The second type of Army ring is a more elegant choice. Featuring flowing lines, it is a less ornate, less massive and much more streamlined. It conveys the wearer’s dedication and service in a more understated way. This ring is sometimes set with a central stone or semi-precious gem. On occasion its central surface has no stone but symbolic image or meaningful text is engraved into the metal at the top. In keeping with its simple elegance, the sides of the band are usually not engraved or otherwise decorated. The third basic design for an Army ring is similar to a signet ring or seal ring. This type has no central stone or gem and uses military coats of arms or Army insignia as the design at the top of the ring. Many rings, no matter which basic design is used, incorporate the beautifully engraved coat of arms, seal or crest of a specific branch or command of the Army, or if the customer prefers, the coat of arms, seal or crest of a specific division, brigade, regiment or other Army unit. Some Army rings include additional heraldic symbols, insignia or other emblems of Army service engraved into the band. The high-quality rings we sell are quite striking and feature intricately engraved detail. And if the center of the Army ring is set with colored gemstones or enameled with vivid colors, the effect is even more dramatic. Rings can be personalized in a number of ways, including engraving the initials or name of the owner into the band. Personalized Army rings are uniquely appropriate to honor the importance of the owner’s past or present service. Military Police and Military Intelligence Rings also available at Military Online Shopping.